Why Do Many English Speakers Struggle with French? French is one of the most popular languages in the world. At nearly 80 million native speakers and 220 million speakers worldwide, it stands behind only Mandarin, Spanish, English, Arabic, and Hindi as the 6th most spoken language in the world. This means that French is a popular choice in many education programs throughout English speaking countries. English speakers tend to start French enthusiastically knowing that mastering the language can open them up to the beauty of French culture. Sadly, this enthusiasm can fade quickly when they begin to struggle through some of the basics in their language programs. If you’re a native English speaker, then don’t panic. There’s a quick way to learn French. All you need to do is prepare yourself by becoming familiar with the challenges English language learners face when they study French. And to help you prepare for your foreign language learning program while maintaining your enthusiasm, here are the eight struggles native English speakers face when learning French. The French language is widely known as being a beautiful language. But to speak the “language of love” properly, you have to be able to pronounce it correctly. And this can be a problem for English speakers. French pronunciation tends to make English speakers’ heads spin. The French language tends to be difficult to pronounce at first because there are simply sounds that native English speakers aren’t used to making. To begin with, French is more evenly stressed. This means that while some parts of a word are stressed, it’s not as distinct as in English. This can make the words look formidable as well if you’re not familiar with them. The great thing about having a lot of grammar and rules though is that once you learn them, pronunciation is pretty straightforward. When you’re reading words out loud in French at first, it can be frustrating. This is because words often do not sound like they’re pronounced. 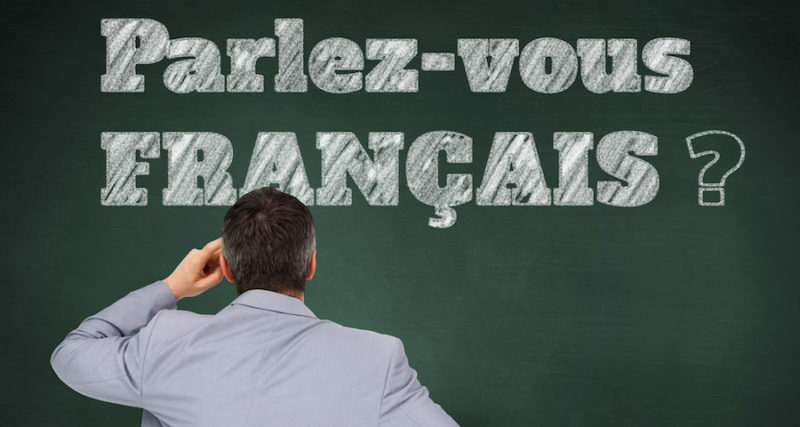 In fact, the Académie Française (Academy of French) recently decided on changes to the French language, specifically how schools teach French, making it a little easier to understand and spell. With the passing of the bill, over 2400 spellings will be corrected to remove silent letters, and several words will drop the accent circumflex (â). French often has letters that are not pronounced as well. Usually, you do not pronounce the ending consonants with the sometimes exception of c, f, l, and r. And “h” is usually never pronounced, except when it is occasionally. However, the letters are necessary as they communicate aspects of the noun, such as the number, which cannot be left out. Liaison further complicates French pronunciation. Liaison is when you pronounce the ending consonants of some words if a vowel or the letter “h” comes after it. An example would be, “les enfants” where you would pronounce the “s” because an “e” begins the next word. If you thought the French pronunciation was complicated, spelling in French isn’t any easier. With French, you must not only remember how to spell the word when many of the letters aren’t used, but you’ll also have to remember all the accents and abbreviate articles correctly according to their gender (more on that next). The critical point to remember here is that spelling takes practice in any language. And the more you do it, the better you become. Many people have difficulty spelling even in their native language. In English, words like conscious and rhyme are often misspelled or confused for example. This is something you’ll want to keep in mind if you can’t seem to nail the spelling of l’écureuil (squirrel). Practice makes perfect. The truth is that there is no logic or pattern to which words have which gender. To remember which article goes with which word, you’ll just have to memorize the article with the word. Learning the words that way will connect the two components so that you’ll see them as one complete unit. While cruising from 1 to 60 is relatively straightforward, things turn weird at 70. This is because French uses a “vigesimal system” after 60. Instead of saying a version of “70” they say, “soixante-dix” or sixty and ten. And then at 80, it gets even stranger, “quatre-vingts” or four twenties. This continues until you arrive at the word for 99, “quatre-vingt-dix-neuf” or four twenties, ten and nine. French counting can be frustrating at first, but the system has a kind of quirk to it that you accept as strange and even remember it easier because it’s so different. English and French have a lot of similarities. English has plenty of loanwords from French, or words it has adapted into its language and the same is true of the opposite. False friends, however, are words that look English but aren’t the words they appear to be. “Librarie” in French means a bookstore. “Attendre” means to wait for something instead of attending. And “Une journée” means day, not journey. And there are plenty more. Like any false friends, these words can create confusion for the beginning French speaker. On the positive side, there are plenty of cognates or words that mean the same in French as they do in English. And these words will give you an easy sense of accomplishment as you realize that your French Vocabulary is already considerably large. Attention, brutal, and continent are a few examples of cognates you can trust. And like with any language, there are exceptions to the rules. French grammar can be very complicated at first, but there are plenty of resources to help support you on your journey to learn French. You want to keep those handy because it’s always best to take the time to make sure you’re learning the language the properly. The best strategy, however, is to keep at it. The more time you spend with French, the more natural it will feel. You’ll quickly remember the grammatical exceptions, master the pronunciation, and improve your spelling. The longer you spend practicing and the more immersion in the French language you experience, the easier it will become.